Tavares: "PSA still has a lot of potential and so far we have only seen a part of it." It's no coincidence that PSA Group CEO Carlos Tavares, who is an avid amateur racecar driver, chose Push to Pass as the name of his latest strategy. Push to Pass refers to a device on a racecar that provides the driver with the ability to boost power for short periods – usually by pressing a button on the steering wheel – to overtake a rival. That is exactly what Tavares plans to do after he and his team successfully met the objectives of his Back in the Race plan three years ahead of schedule. Under the Back in the Race plan PSA swung to a 1.2 billion euro profit last year after losing more than 8 billion euros from 2012 to 2014. Now Tavares wants to triple the automaker's profit margin target, launch nearly 40 new or revised models including a family of hybrids, flex its muscles in the aftermarket, car-sharing and mobility services markets all while maintaining a laser focus on keeping costs down and vehicle prices up. "We aim to become the world’s most efficient carmaker," Tavares told Automotive News Europe. "The new plan is our lever." But initial reaction to the plan, which was announced April 5, was not very positive. PSA's shares fell by 6.5 percent that day, pushing down the entire Eurostoxx auto index by 3.9 percent. Many financial analysts were unimpressed with PSA's 4 percent profit margin target for 2016-2018, especially after the automaker had a 5 percent margin last year, which was the best result of any European volume automaker and easily beat PSA's goal of reaching a 2 percent margin by 2018.
up from about 8 percent now. Start construction of plant in Southeast Asia by 2018. LATIN AMERICA – Double sales to about 314,000 vehicles and triple operating profit, both by 2021. A key to improving profitability will be boosting local sourcing to 85 percent by 2021 from about 54 percent now. EURASIA – Achieve a fourfold increase in sales to about 48,000 units by 2018 and reach a “high double-digit” margin by 2021. PSA declined to reveal its current margin in the region. demand from those plants by 2021. INDIA-PACIFIC – Increase sales 50 percent to 36,000 by 2021 with the help of a new partnership that should be finalized by 2018. Start production in the region, most likely in India, before the end of 2021. "A 4 percent average operating margin target to 2018 is too low," Harald Hendrikse, a London-based financial analysts at Morgan Stanley, wrote in a note to investors. Hendrikse added that PSA's aim to boost its profit margin to 6 percent by 2021 was "very ambitious but too far in the future for most investors." Tavares said that PSA's 2015 margin was much higher than expected because of Europe's strong rebound as well as raw material and currency exchange tailwinds, which he estimates accounted for about one-third of last year's operating result. He also pointed out that 4 percent is the lowest margin he would accept, adding that that target is "four times the average 1 percent margin that the company had delivered in the last 15 years." Exane BNP Paribas analyst Dominic O’Brien had a more positive assessment of Tavares's new plan, calling the growth targets "well judged and set against clearly tight capital discipline that is rare in the sector." O’Brien, however, is unsure whether the automaker will be able to reach its 6 percent profit target. "Our key lingering concern is whether PSA will be able to achieve the planned material improvement in pricing from new product as EU market growth slows," he said. One of Tavares's main challenges is to reduce PSA's reliance on Europe, which accounted for 63 percent of its car sales last year. The market's decline to a two-decade low in the aftermath of the sovereign-debt crisis prompted a bailout by the French government and China's Dongfeng Motor in 2014, with each taking a 14 percent stake in the automaker. "We are strong in Europe and in China, the new plan is all about growing elsewhere to reduce the vulnerability of the company," Tavares said, adding that his new plan addresses this weakness by putting more emphasis on PSA's non-Europe operations (see box, below). Meanwhile, the new plan also calls on PSA to maintain its strong position in Europe, where it ranks as the region's second-largest automaker by sales after Volkswagen Group. In addition to that, Tavares wants PSA to become Europe’' No.1 volume brand based on profit margin starting in 2018. It is unclear how PSA will be able to prove it has done this because it currently does not report its financial performance by region. The same is true for Volkswagen Group. Right now the only companies providing that level of financial visibility are Fiat Chrysler, Ford, General Motors and some Japanese automakers such as Toyota, Mazda, Mitsubishi and Honda. One of the reasons PSA has been able to smash through targets well ahead of schedule is because Tavares has no tolerance for waste. Under his guidance PSA quickly reduced its production breakeven point to 1.6 million vehicles a year from 2.6 million in two years. The CEO's commitment to frugality remains strong because he says PSA's "level of waste is still very high." The new plan addresses this problem from multiple angles. Each PSA subsidiary should cap its general and administration expenses at 1 percent of revenue. Tavares also wants PSA to reduce its vehicle-production cost by 700 euros per vehicle between 2015 and 2018, compared with a previous target of 500 euros over the same period. Last year, the saving was about 211 euros per vehicle, the company said. By spending wisely Tavares expects to have the cash it needs to invest in new technologies. That includes the seven plug-in hybrids and four battery-powered vehicles he wants the company to launch between 2019 and 2021 as part of a 34-vehicle product offensive. 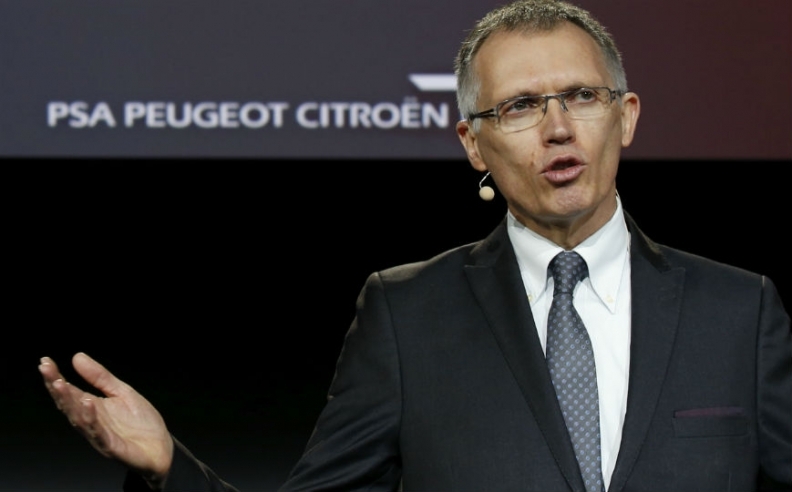 Tavares also wants to equip Peugeot, Citroen and DS models with semi-autonomous driving features such as traffic jam assist by 2018 and start rolling out fully autonomous vehicles by 2021. On the second objective, Tavares plans to be cautious because he is unsure whether a volume player will be capable of making a profit from autonomous cars by the early 2020s "because of the huge amount of technology you need to make these products drive safely." While Tavares will hold back a bit longer on making a big commitment toward autonomous cars, he will be much more aggressive in transforming PSA from an automaker into a mobility provider, a move he expects will generate more than 100 million euros toward the company's operating profit by 2021. The cash will come via a number of initiatives that include a multi-brand leasing company for business-to-business customers in Europe; increased sales of service contracts in Europe (the goal is a penetration rate of 60 percent five years from now from 33 percent in 2015); and offering insurance based on "pay as you drive" or "pay how you drive" billing. Another way PSA plans to expand its value chain is by increasing aftermarket revenues by 10 percent within two years and another 25 percent by 2021. To do so, PSA will try to maintain a lengthier service relationship with customers who, as their vehicles age, tend to switch to independent repair shops because they historically have offered lower prices for the work. To change this, PSA will expand its Euro Repair Car Service network to 10,000 locations from 2,000 last year. This network offers competitive prices on components that come from the same partsmakers that supply the French automaker's production vehicles. PSA also will try to lure more customers in Europe to use its mister-auto.com internet portal, which offers low prices on a number of parts that customers can install themselves. PSA also expects that by 2021 it will generate 300 million euros in annual revenues from its car-sharing, fleet-management and connected-car services. At the same time, the company is setting up a 100 million euro venture capital fund to promote innovative mobility solutions and applications. While Exane's O’Brien is positive about PSA's move into new business areas, he said that none of the steps the French automaker plans is unique. "All OEMs – not to mention many non-auto players – will chase mobility services and we are not sure what gives PSA a competitive advantage," he said. This story is from the May issue of the Automotive News Europe monthly e-magazine, which is also available to read on our iPhone and iPad apps.You can download the full issue as well as past issues by clicking here. Tavares is not overly worried about what the critics say. He has turned PSA from one of Europe's worst money losers into a company that he believes is poised to rise even higher because of its new plan. "The purpose of the strategy is to unleash the full potential and the full energy of the company," Tavares said. "PSA still has a lot of potential and so far we have only seen a part of it."